Baby Namings – A Real Blessing! 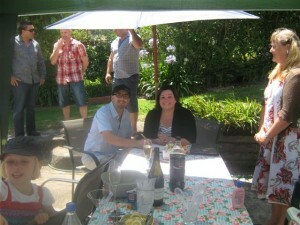 Henry’s Mum and Dad – Lisa and Keith, re contacted me following a ceremony I had performed for them 2 years ago. 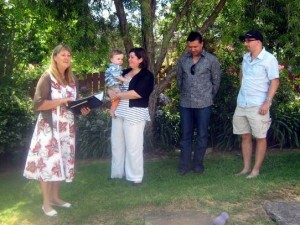 It was a combined Renewal of Vows for them and a Naming Ceremony for Henry’s older sister, Maggie. Henry’s Naming was to be a simple, child friendly ceremony at his home, surrounded by friends, neighbors and playmates. Keith and Lisa are from England and they have no extended family here in NZ. They really wanted to acknowledge their special NZ friends who have stepped up to play an active part, in loving and supporting them and their two beautiful children. The Naming ceremony talked about Henry’s life to date, all his qualities that make him unique and the origins of his name. 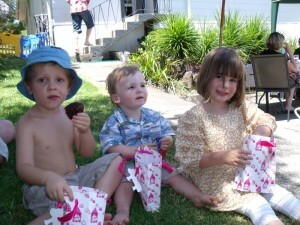 We also touched on the special relationship between Henry and his big sister Maggie. 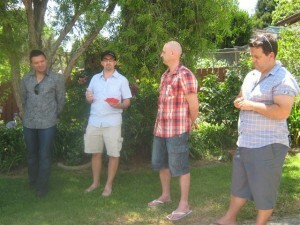 Three fabulous men, Shannon, Jamie and Ian, were appointed as mentors and role models for Henry. Lisa spoke tearfully about the special qualities of each of these 3 lovely men and then Keith lovingly spoke about their wishes and hopes for Henry in the future – very touching. Following the ceremony, a tasty lunch was enjoyed by all, with the children’s food provided in specially made lunch bags. The afternoon concluded with some sandpit and ‘slippery slide’ fun, which even the adults got in to. In a climate where we hear so much about child abuse and family violence, it is such an honour to meet loving parents, who cherish, honour and raise their children with so much love. – A real blessing!